(Nico Daams, 30 January 2017) It is already more than 2 months since our friend and colleague David Tago died. It is hard to believe that he is no longer with us. 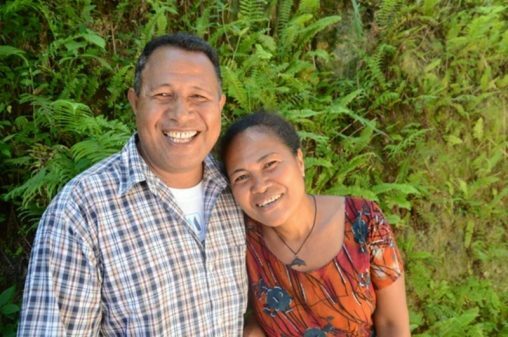 David’s widow Ribeka is now back in Honiara so she can provide a base there for her three oldest children to continue with their education. Ribeka is firmly committed to continue with the translation work that she and David had started after completing their studies at C.L.T.C. She plans to revise the Rennell-Bellona New Testament over the next few years, then continue with the translation of the Old Testament. Ribeka needs our help. The Isles of the Sea project covers most of her project expenses, but we need to find additional support to cover her living costs in Honiara. We have now received green light from Wycliffe USA to establish a Member Raised Funds Project to help with this need: the Rennell-Bellona New Testament Revision project. Maybe you feel you can help with this need. If ever there was a project worthy of our support, it is this one. You can make a donation to this project online through this webpage, or by sending a check to Wycliffe USA, with the mention: “For the Rennell-Bellona NT project IPC 9490”.